I've been using this slide a bit in some of my recent presentations. 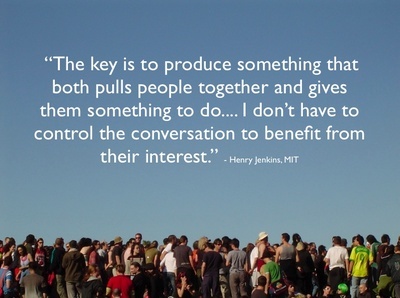 I find it is a helpful way to get the discussion going about marketing (pulling people together and giving them something to do) and public relations (you don't have to control the conversation to benefit from it) in a social media context. Stormhoek understood this when they began sponsoring geek dinners. Mitch Joel understands this with his fantastic weekly podcast. Apple continuously shows they understand this by making elegant products worth talking about. And Barack Obama certainly understands this. Brilliant slide and good point.